You can earn 630 yards with this purchase! 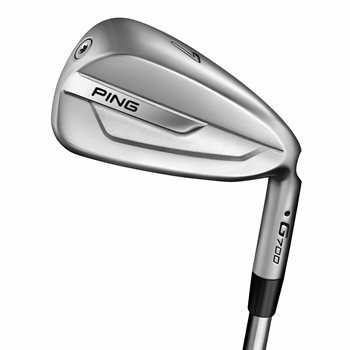 The Ping G700 iron is Ping’s longest, highest-flying iron to date. The G700 iron features a 17-4 stainless steel head with hollow-body construction and internal geometry design that greatly increases ball speed for launching the ball higher and farther. The C300 maraging steel face generates twice the face flexing to increase ball speed and distance while the low and extreme heel-toe perimeter weighting ensures high inertia and tightens dispersion. The sole width, bounce and offset allow for better turf interaction to improve ball striking. The G700 iron also features a clean cavity, hydropearl plating and polished accent for a confidence inspiring address view. Are these clubs for advance or average players??? These can be used by either and are designed to provide maximum distance with their hollow design. They are somewhat like a hybrid that is shaped like an iron.